TASTELESS & ODORLESS. 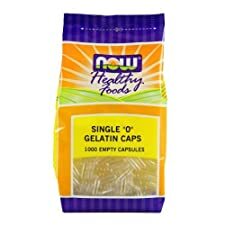 Our empty gelatin capsules have no taste so your custom supplement pills and DIY vitamins are easy-to-swallow with no unpleasant taste or smell..
PRE-SEPARATED PIECES = LESS PREP TIME. Some brands send you empty capsules you have to take apart before you can fill them. Ours come in separate resealable bags for efficient use & storage.. LIFETIME MONEY BACK GUARANTEE! We stand behind all of our products. If you're not 100% COMPLETELY SATISFIED, just send us an email, and we promise to make it right!. GLUTEN-FREE & EASILY DIGESTABLE. 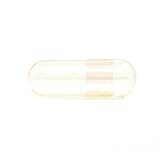 Our super-pure, pharma-grade fillable pill capsules are free of impurities as well as gluten and dissolve gently in the stomach without irritation..
LOCKS TIGHT TO PREVENT LEAKS. Don't stress about whether your custom nootropic powder mix will spill out while you travel- our fillable capsules snap closed to let you know they're sealed. 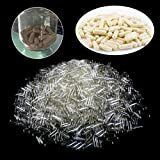 PRE-SEPARATED, TASTELESS & TIGHT-LOCKING, our empty gel capsules are the best fillable pills for making DIY nutritional supplements! Skip the hassles of the other brands that will leave a bad taste in your mouth- literally! SuperDosing guarantees our pill capsules will arrive intact, carry no odors or tastes & will lock tightly so your powders or oils won't leak out during storage & transport. 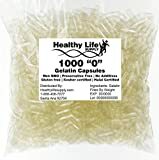 Save money by making your own nutritional supplements into handy gelatin capsules! Our bulk pack of empty gelatin capsules makes it easy and affordable to create your own vitamins from your trusted herbs and bulk powder supplements. 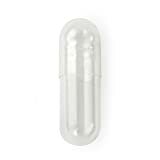 Our capsules come pre-sorted into their two pill halves so you don't have to take them apart before filling them. Just grab one of each half out of the resealable bag, and fill away! 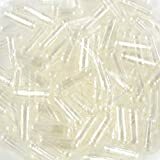 Need different sizes of capsules? You're in luck! 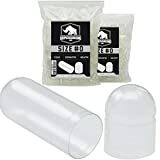 SuperDosing offers clear fillable capsules in: Size 00 Capsules Size 0 Capsules Size 1 Capsules Tasteless, odorless empty gelatin capsules make taking vitamins or pills easy! 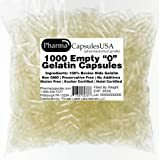 If you hate the taste of small tablet pills or your pet can smell that pill even through a pill pocket, try enclosing those pills in a gelatin capsule! They are easier to swallow than tablets or caplets, and your pet won't be able to smell medication through the gel shell! 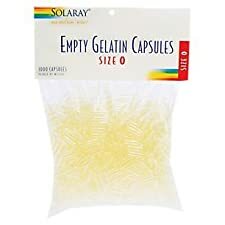 How long do these gel capsules take to dissolve? It takes about 10-30 min depending on how recently you've eaten and how much you've drank Lifetime Money-Back Satisfaction Guarantee! If you aren't completely satisfied with your order, simply reach out to us through the Amazon messaging service and we will respond within 24 hours to make it right even on the weekends. We absolutely guarantee your satisfaction or your money back! 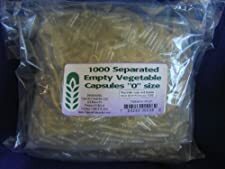 Empty gel caps '0' 1000 caps by now foods. Now foods product upc : 733739051509.